Is the Premier League too reliant on foreign talent? The evidence certainly seems to suggest that this is the case. Recent research by UEFA found that the Premier League has the highest percentage of foreign players (69.2%) from any European League. Interested in foreign players, TicketGum.com utilised data from ‘CIES Football Observatory’, to calculate how many minutes from the 38 2017/18 league matches played by each Premier League team were done so just by their expatriate players. The total number of minutes from all 38 matches was found to be 3,420 minutes per club. ‘Expatriate players’ are defined as: “footballers playing in a different association from that where they grew up”, according to the CIES. TicketGum.com discovered five-time Premier League champions Chelsea to be the most reliant on foreign players in 2017/18, with 2,973 minutes from a total of 3,420 available minutes played by expatriates from their first squad. The equivalent of 33 Premier League matches contested solely by their foreign team members such as Eden Hazard (Belgium) and N’GoloKante (France). Thereafter, Arsenal was the team next most dependent on their imported footballers last season, with 2,749 minutes competed by them alone. Which is comparable to 31Premiership games played only by their overseas players like Mesut Ozil (Germany), Alexandre Lacazette (France) and Hector Bellerin (Spain). Interestingly, Burnley rank 17th, with 1,419 minutes spent on the pitch by their foreign players in 2017/18. 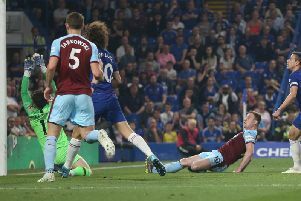 This equates to 16 matches consisting exclusively of their international stars such as Steven Defour (Belgium), Johann Berg Gudmundsson (Iceland) and Chris Wood (New Zealand). On the other end of the table, Bournemouth was the club least reliant on foreign players in 2017/18, with a mere 1,081 minutes spent on the pitch by expatriate players from their squad. Slightly above, Everton fielded more of their foreign talent - with 1,258 Premier League minutes played by their overseas footballers last season. Overall, from a grand total of 34,200 minutes of Premier League football last season, 20,883 minutes were played by foreign players. To put it into similar terms, 232 Premiership games from an entire 380 played completely by expatriate footballers present at all 20 clubs in the 2017/18 season. A spokesperson from TicketGum.com commented: “The presence of foreign talent undoubtedly elevates the status and quality of the Premier League. Majority of foreign footballers bring a high level of technical ability and an unparalleled determination for success. ”Expatriate players who could make great additions to squads should be encouraged, but when clubs do this, they should be wary about diluting English players from their squad. ”They should when and where possible, seek to promote home grown players who show real potential from their youth set-up into the first team. In doing so, they will not only breed more English footballers, but allow them to reach greater heights in their personal development by training with and learning from foreign players”. See https://www.ticketgum.com/ for more details.